Providing fleet managers with an automatic vehicle location monitoring system that is adaptable to a variety of specific applications, the Romteck Deltatrack system collects, stores, and relays operational data and GPS information to a control centre. Romteck understand that long haul road transport and short haul fleet operators, as well as railways, ferry fleet operators, and military and mining operation contractors require real time information to optimise and provide the most efficient use of resources. With the Romteck Deltatrack automatic vehicle location monitoring system, users can display, analyse and record the information gained as a resource management tool for improving operational efficiency, cost effectiveness, and even security. 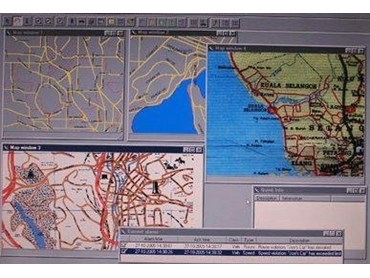 The Deltatrack automatic vehicle location monitoring system uses an in vehicle Deltatrack vehicle terminal unit, or VTU. This VTU acts as an intelligent controller by collecting data from the attached sensor interfaces and on board computer and engine management systems. This data is then transmitted via the vehicles radio or other communication system to a central control system. All communication protocols are handled by the VTU. Advances in computing and communications technologies now provide opportunities for the real time monitoring of position, performance, and environmental parameters in road, rail, and other vehicles virtually anywhere in the world, and the Romteck Deltatrack is an ideal automatic vehicle location monitoring system for the job.